Seven years in development, Silkin is the answer. We originally designed it for those with thick, long and big hair. The great news is that is is even better for people with short, silky, straight and thin hair. Men especially noted that they love the quick lather and ended up using it as a shave soap as well. Color and perm safe, it is truly a revolution in hair care. Do not take our word for it. Click Here to order a $0.49 sachet good for a couple of washings or next time you order, you will get a sample of Silkin free automatically. Silkin is an extension of our KPRO line. 6 months of testing has received many accalades from hair stylists, designers and everyday users looking for a natural alternative to conventional shampoos. Silkin contains the same OptiFX particles that are in KPRO tinted products. Silkin opens the hair cuticle to clean and the OtiFX particles cling to the cuticle to offer a color enhancer, special shine and shimmer. 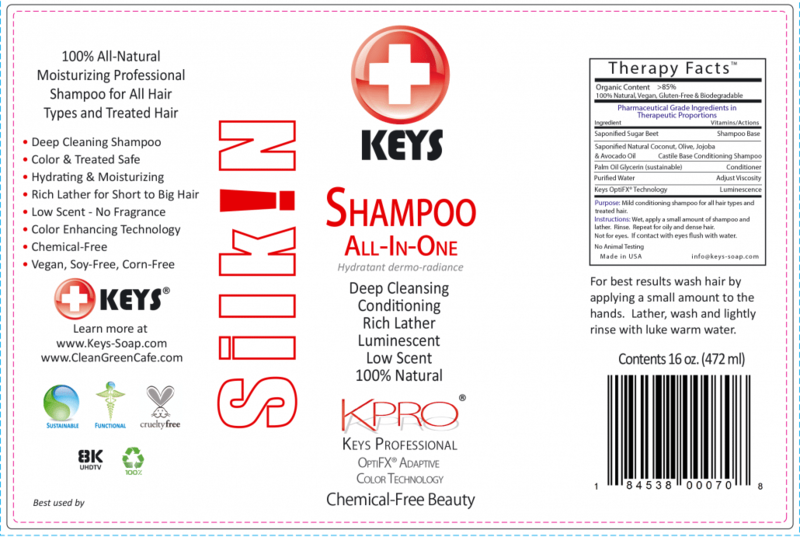 Silkin is 100% All-Natural Moisturizing Professional Shampoo for All Hair Types and Treated Hair. This KPRO Shampoo is designed to replace conventional shampoos and conditioners with professional results.